Cobequid Consolidated Elementary students were excited to have an award-winning singer come speak to them at the end of March! 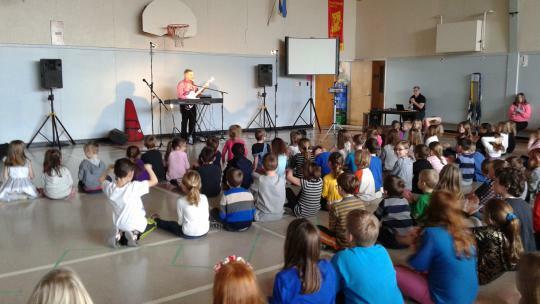 East Coast singer-songwriter, Terry Kelly, provided students of Cobequid Consolidated Elementary with the opportunity to sing, dance and banish the words “I can’t” from their vocabularies. Singing some of his well-known hits, including the Remembrance Day-themed “A Pittance of Time,” Terry related some of the challenges he overcame as a child attending the Halifax School for the Blind. He urged the enthusiastic audience to become problem-solvers and set a good example for others – even their parents. The students were thrilled to have such an inspirational person share their talents and experience with them!